(Nanowerk Spotlight) Nanotechnology has recently found practical applications in the conservation and restoration of the world’s cultural heritage. Nanoparticles of calcium and magnesium hydroxide and carbonate have been used to restore and protect wall paints, such as Maya paintings in Mexico or 15th century Italian masterpieces. Nanoparticle applications were also used to restore old paper documents, where acidic inks have caused the cellulose fibers to break up, and to treat acidic wood from a 400-year-old shipwreck. Aside from the enormously rich cultural resources in the city of Florence, it is one of the most suitable places for conservation studies. For example, after the 1966 Florence flood, the Center for Colloid and Surface Science (CSGI) research group at the University of Florence, founded by Prof. Enzo Ferroni and currently directed by Piero Baglioni, was the first academic institution that applied a rigorous scientific approach to the investigation of cultural heritage degradation. 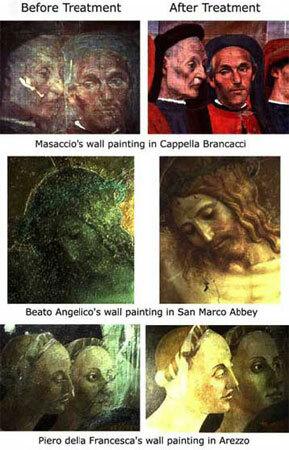 CSGI has developed the most advanced nanotechnology-based methods for the restoration of wall paintings. These include methods for cleaning and removal of resins from wall and oil paintings, for frescoes consolidation, and for paper de-acidification. Currently these methods are used in many parts of the world. Applications of nanotechnology-based processes to wall paintings consolidation and paper de-acidification have recently provided clear evidences of the huge potential of nanotechnology for cultural heritage conservation. Nanodispersions of solids, micelle solutions, gels and microemulsions offer new reliable ways to restore and preserve works of art by merging together the main features and properties of soft-matter and hard-matter systems, allowing the synthesis of systems specifically tailored for the works of art to fight the deterioration processes which threaten many priceless masterpieces. In a recent review, ("Soft and hard nanomaterials for restoration and conservation of cultural heritage"), Piero Baglioni and Rodorico Giorgi suggest that using nanoparticles is a simple and successful way to restore works of art. The authors explain that, until recently, most of the methods for the restoration or protection of artefacts used commercial products, mainly synthetic polymers, and were not tailored for specific applications to the artefacts. In controlled environments, the application of these polymers to fix powdered and flaked paints, or to re-adhere detached modelled polychrome stucco fragments, produced acceptable results. However, in most cases the use of synthetic polymers produced just after a few years dramatic effects on the artefacts as detachments, flaking of surfaces and a strong acceleration of the chemical reactions involved in the paintings degradation. Baglioni explains the core principles of succesful restoration: "Restoration should provide the reinforcement of the porous structure and the consolidation of the surface layer of artefacts. A few simple principles can be considered to define the most appropriate restoration method: 1) the treatment should be reversible so that one can revert to the original status of the work of art at any desired time; 2) all the applied chemicals must ensure the maximum durability and the chemical inertness; 3) the applied chemicals must invert the degradation processes without altering the chemical composition of the artefacts and their physico-chemical and mechanical properties, i.e. the applied chemicals must be as compatible as possible with the artefacts’ materials." Wall paintings, especially in Europe, are often made with slaked lime according to the fresco technique. Chemical and physical degradation, promoted by rain, wind, dust, pollutants and other environmental causes, induces the weakening of the porous structure and of the surface layers of stones or wall paintings. This is due to the 'chemical corrosion' of the binder, usually calcium carbonate, with the loss of cohesion between pigments and substrate. The so-called Ferroni–Dini method (two steps: the application of a saturated solution of ammonium carbonate, (NH4)2CO3, and the treatment with a barium hydroxide solution, Ba(OH)2), also called the 'barium' method, has long been the acknowledged method for the removal of salts that threaten paintings, reinforcing at the same time the porous structure. However, commercially available carbonates and hydroxide powders have dimensions of several micrometres, much larger than the pores on the paint surface. This means they don’t penetrate the painting well and there is also a risk of damaging the artwork by a white glaze forming on the surface. Nanoparticle treatment is the logical evolution of the Ferroni-Dini method. Dispersions of kinetically stable Ca(OH)2 nanoparticles in non-aqueous solvents solved most of the drawbacks of the microsized powders. Stable dispersions of calcium hydroxide have been successfully applied (replacing polymers) as fixatives to re-adhere lifted paint layers during many restoration workshops in Italy and in Europe, and as a consolidant. Baglioni's group was among the first to synthesize nanoparticles in non-aqueous solvents with the optimal properties for application to cultural heritage conservation. Nanoparticle-based conservation applications have been used with excellent results for the in situ conservation of stucco and paints in the archaeological site of the Ancient Maya City of Calakmul in the Yucatan peninsula, a UNESCO World Heritage Site. Hydroxides or carbonates can also be used for conservation of paper and wood. Alkaline nanosized particles, applied from non-aqueous dispersions, have been found particularly efficient for the preservation of cellulose-based materials. Another interesting application of hydroxide nanoparticles was the de-acidification treatment of acidic wood from the famous shipwreck Vasa, recovered 44 years ago after 333 years spent in the seabed of Stockholm harbor. Vasa wood developed a large amount of sulfuric acid that consistently decreased wood pH. The application of nanoparticles of calcium hydroxide and magnesium hydroxide conferred a neutralization effect and provided an alkaline reserve that protected the wood from aging.